Anyone that takes their art education seriously will know the importance of the fundamentals. These fundamental topics are like the foundation of a building: you need the foundation before you can get more detailed. Whether you want to work as a visual development artist, concept artist, animator, illustrator, or anything else in 2D/3D art, fundamentals are a necessity. But how do you get started? In a recent post I explained the importance of fundamentals and in this post I’d like to focus on a few of these topics with helpful learning resources. The best way to get better is to practice. But you need focused practice to see the best results. If you want some advice from a master skip to 35:40 in this FZD podcast. Feng Zhu is a veteran concept artist who runs his own entertainment art school in Singapore. He only teaches the fundamentals and he explains why these are so damn important for every artist to learn. The idea of form is very general but also very important. Artists who learn to recognize form see beyond the 2D paper(or screen). They’re able to create objects that look realistic because the forms look jubilant and lively. Forms define anything with volume. The human body has a lot of different shapes and forms, especially in the face. Your ability to see and understand forms will be crucial to your success as an artist. This is a fundamental skill for good reason. So how do you practice this fundamental skill? I find it’s best to start with shapes. Everything in life can be broken down into smaller forms like spheres, cones, cylinders, and boxes. If you can draw these basic shapes in every perspective then you can reconstruct anything. If you want to better define your forms then follow through with cross-contour lines. This guide will get you started and show you some great examples. This can be one of the easiest skills to practice but one of the toughest to master. You’ll need to put in the work and really try to see, not just copy. When you start drawing from life you might try the Drawabox lessons just to practice forms consistently. Another must-have skillset is the ability to draw or paint in perspective. You can find lots of great articles talking about what perspective is and how it works. But there’s only so much free content out there to help you learn. However I will admit there are dozens of free perspective tutorials on YouTube if you search hard enough. This is probably the best place to start. Seeing in perspective is knowing that as things move away from the viewer’s eye, things seem to get smaller. Terms like horizon line and vanishing point are basics and must be understood to learn perspective. Perspective is something you just get better at with practice. It also connects into everything you create. 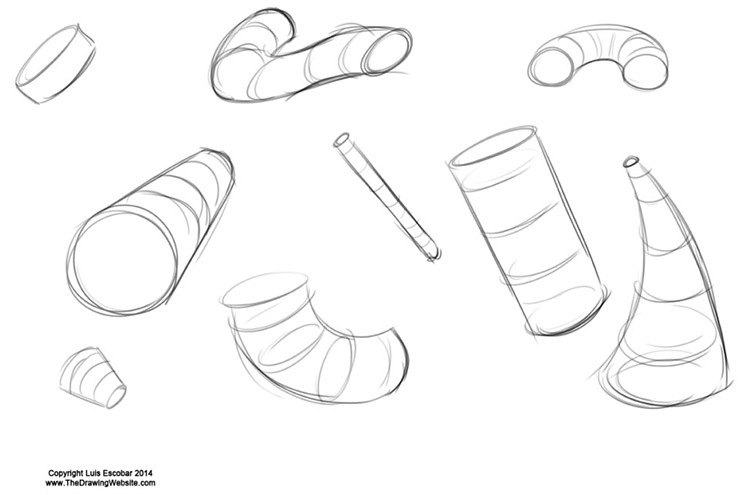 For example, the last section recommended exercises for drawing boxes and cylinders. To draw them correctly they’ll need to be in perspective, whether you understand the rules perspective or not. Just keep drawing stuff and branching into new avenues. As you get curious about perspective look up some tutorials and follow along. Some videos may recommend using a ruler while others force you to train your eye. The concepts really aren’t hard to master but they do take time. And the best thing about perspective is that you don’t need to worry about tone, value, colors, or light/shading. These are necessary skills if you’re working for a finished drawing. But a simple perspective exercise can be done in one single tone. If you want a jumpstart in your perspective work there are two books you should try. The first is Perspective Made Easy, very cheap and a classic for new artists. More intermediate artists(or confident beginners) should also study from Scott Robertson’s How To Draw. The book offers real practical advice with exercises and case studies that will help you improve drastically. There are tons of perspective books you can try so it’s good to have a plan of how & what to study. But to give you a variety of choices here are some other perspective books you might like. Some may argue that anatomy is not a fundamental topic because it’s not required for a good drawing. 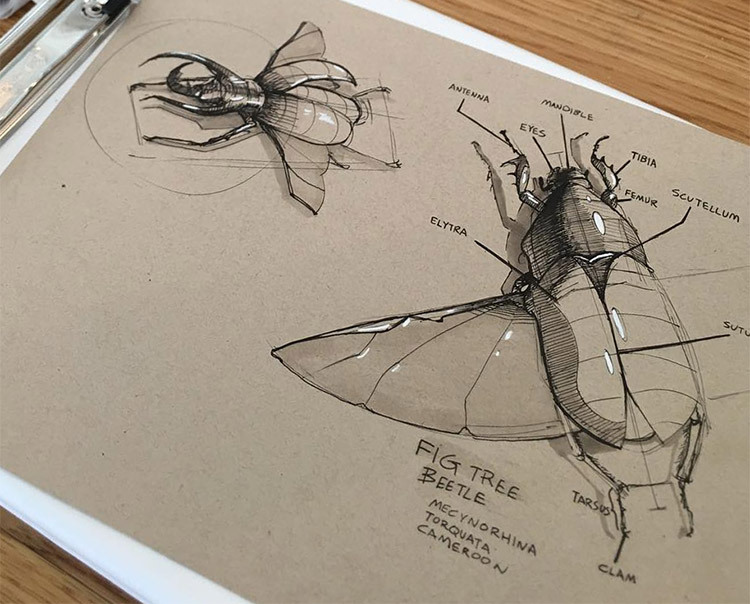 But it is a fundamental for professional work, especially in entertainment art because it applies to any living creature that you try to draw. Once you understand how joints work you’ll be able to see how bones and muscles move. This applies not just to humans, but to any animal or creature with a skeleton. But anatomy is one of those topics you can study for years and still not master. It’s a fundamental concept but very difficult to internalize. But you have to start somewhere, so just start slow and try to focus on one area at a time. If you’re just getting started with anatomy there are two resources I’d recommend. The first is Goldfinger’s Human Anatomy for Artists. This is very dry and not meant to be a one-off learning resource. But it will prove invaluable as a reference guide because it’s so exhaustive and reliable. Brand new artists studying anatomy will do great with Proko’s anatomy video course. It’s broken into three different courses so you can choose to pick up the areas you really need to study. This is what I use to study anatomy and I would never have wanted to start anywhere else. Stan is an amazing teacher, both with his demonstrations and his choice of words when explaining things. I’ve yet to find a better anatomy series and while there are many options out there, Proko’s is cheap and great for beginners. Anatomy is hard. Not just because of the technical component, but because of the sheer volume of information. Don’t let this overwhelm you. Study anatomy in bits and do lots of studies. Get out to figure drawing sessions whenever possible. There’s no replacement for working from a live model. 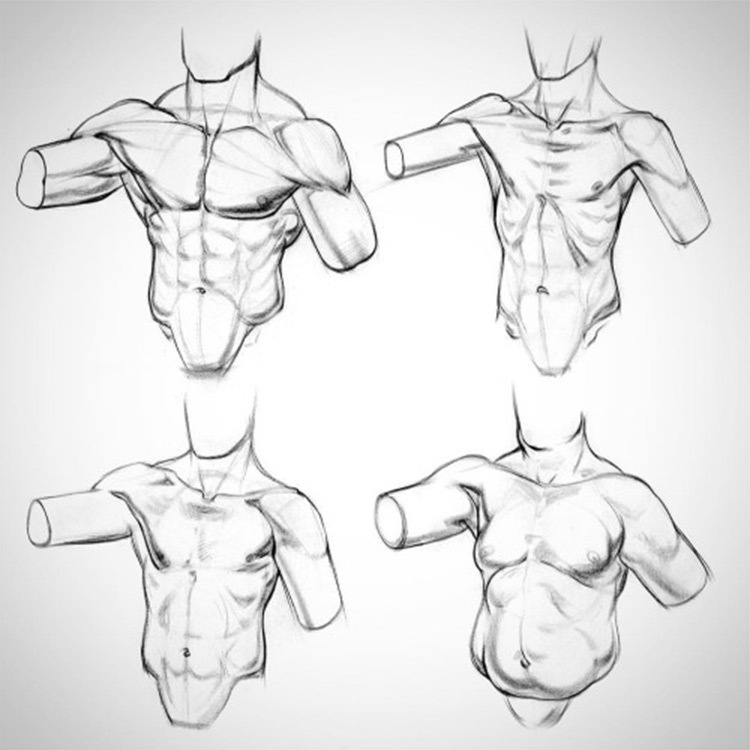 Anatomy studies will also help you understand proportions and relationships between elements. This Tuts+ guide is a nice place to get started reading about this stuff. Composition is harder to teach from scratch because it’s more about the finished artwork. When all the pieces come together and form a whole you get a composition. The overall layout of a piece is very important. Artists often consider things like the rule of thirds or the infamous golden ratio. Neither truly defines a composition, but they can both go into your decision making. Your choice of composition is defined by size, angle, perspective, and attention on foreground/background objects. As you can tell this fundamental skill really gets developed later in your artistic progression. But it’s still something you want to consider while practicing. It becomes much more important when you move onto digital painting because every painting sets a scene. You can find lots of composition tips but it’s tough to actually teach fundamentals of composition without actual practice. My suggestion is to study the work of other artists. You’ll stumble onto paintings that just stand out to you for whatever reason. Save these and keep them in a folder for inspiration. Check back every so often and try drawing your own ideas with a similar composition. I’d also recommend learning a bit about composition as it relates to photography. A lot goes into crafting beautiful photos and professional photographers follow similar compositional guidelines. The best study material is a book called Mastering Composition by Ian Roberts. It’s a few years old but the material is priceless and genuinely useful to all forms of art. Plus it comes in CD/audiobook format if you’d prefer that route. If you practice and keep pushing your compositions I guarantee everything will start to click. This is a fundamental skill that takes a while to build up and understand. But once you get it you won’t be able to lose it. Two other books I’d recommend for artists studying composition are called Pictorial Composition by Henry Rankin Poore and one simply titled Composition by Arthur Wesley Dow. The subject of value is immensely detailed because it covers everything related to rendering. Your knowledge of form will prove immeasurably helpful when studying value. If you’re brand new to value then just keep drawing and trying to render as best you can. You’ll find free videos on YouTube that teach rendering, but none will give you everything you need. I recommend doing lots of value studies especially when you’re just starting to learn art. They can be stressful but they can also be very educational. Start out with still life drawings and progress into portraits. Stan Prokopenko has a great portrait drawing course which can help you practice the fundamentals of drawing realistic faces and nailing the values. Simply drawing objects around the house can yield fruitful results as well. Inanimate objects don’t move so you get the chance to study from life and expand your efforts across days or weeks at a time. Studying value is very much the study of light and shadow. But there is a technical side of light that you’ll want to pay attention to if you’re going for technical rendering. Lighting implies shading and vice-versa. You can’t have one without the other. Once you get into painting you’ll be more concerned with colors in your lights & darks. But you should always be able to convey the same message through drawing with basic materials. Shadows are cast in the absence of light, so there’s always a part of the object receiving more light than other parts. This makes sense in theory but it’s a whole different ball game when you put it into practice. Check out this Tuts+ article if you want to learn more about lighting & shadows. Your values can be the same whether you’re using color or grayscale. 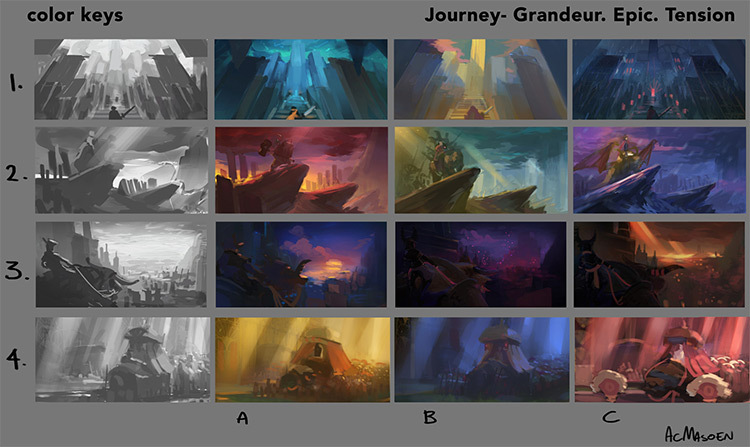 This is the beauty of studying value because it really helps you improve your color selection later on. Take a look at the color keys and composition pained by Singaporean artist AC Masoen. His understanding of light is expressed brilliantly in these keys. Rendering is not very tight, but expression is high enough quality to get the message across. This is how powerful the fundamentals of value and light can be. For learning recommendations I cannot overstate the importance of How To Render. Scott Robertson is a skilled artist and this book should be regarded as the best guide for beginners to jump into value. It is a big book and it covers a lot. Probably more than a typical beginner needs to know. But this is why it’s so great because How To Render will keep teaching you for years after you buy it. For a more technical guide I recommend Light for Visual Artists by Richard Yot. Easily one of the highest-rated books on this subject for good reason. Moving on from value is the somewhat-related but very different subject of color theory. It’s way too large to break into here. But if you’re ready to move into color then be sure you have Color and Light by James Gurney. Undoubtedly the best book you could get for understanding how light affects colors in a painting. The last book I want to recommend wraps up all these fundamentals into one big compilation. It’s called Art Fundamentals and was written by three concept artists working professionally in the industry. It covers all the major fundamentals like perspective, light, anatomy, and composition. It’s not as in-depth as my other recommendations, but it is one of the few books focused solely on the fundamentals. Also it was written by professional concept artists so their teaching methods align perfectly with aspiring artists looking to work in the industry. At the end of the day it doesn’t really matter how you study or which books/courses you use. All that matters is the total hours you spend practicing. So pick whatever interests you the most and just get going! If you can practice for 6-12 months only on fundamental skills you will see noticeable improvements. Fundamentals are crucial to every entertainment art career and they truly pave the way to your future success as an artist.